UFC 191 in at the MGM Grand in Las Vegas on Saturday night. The main card is on pay-per-view and it has to be one of the weakest PPV cards of 2015 outside of the main event. We’re getting a title fight in the flyweight division, but there isn’t much else to like. Demetrious Johnson is fighting John Dodson for the Flyweight Championship. This is the second time these two guys have fought each other – Johnson won the first bout by decision. The co-main event is between Frank Mir and Andrei Arlovski – two veterans. 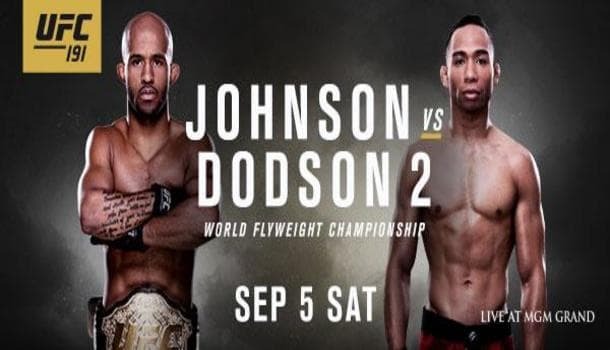 You can get the best line on Johnson (-500) at Bovada, while Dodson (+425) is available at this price at 5Dimes. With the UFC, it’s extremely important to line shop, as they can vary a lot. The over/under is 4.5 rounds with the over juiced. The over 4.5 rounds is priced at -185, while under 4.5 rounds is priced at +165 odds. The bookies expect the judges to decide this one. These two fought in 2013, but a lot has changed, so let’s analyze this main event. Demetrious Johnson (22-2-1) hasn’t lost since 2011 against Cruz. He has eight wins in a row and all of those wins have come against the best fighters in the weight class. John Dodson (17-6) hasn’t fought much and I’m surprised he’s getting a title shot. The issue is Mighty Mouse has beat just about everyone else in the division, so Dodson is getting a shot. These two are the same height and have identical reach. Johnson ranks out slightly better in the stand-up, as he averages 3.46 SLpM and 1.76 SApM (Dodson: 3.26 SLpM & 3.37 SApM). Johnson definitely has the better defense, but Dodson has more power. Dodson has knocked out eight fighters, including two of his last three. Johnson looks for the sub more often than not and he has been effective lately, as he tapped out his last two opponents. Where Johnson has an even bigger edge is with his takedowns. Johnson lands over a takedown a round on average and he had 5 takedowns in the first fight against Dodson. Johnson will score plenty of points for landing takedowns, which will help him if this fight goes the distance. However, my money is on Johnson winning this fight inside the distance (ITD). You can get Johnson ITD at +222 at 5Dimes right now. Bet on every UFC 191 main card fight at BetOnline and get a $1000 bonus this week. Arlovski (24-10-0-1) has five wins in a row and he just beat Browne by TKO in R1. Mir (18-9) has two KO wins in a row, but Arlovski hasn’t been KO’ed since 2011 and Mir won’t change that. Johnson (19-5) was tapped out by Cormier last time out, but he’ll beat Manuwa (15-1). Manuwa can jump into title talk with a win, but he’ll get picked apart by the bigger Johnson. The money line has no value, but I’ll be on Johnson by TKO/KO at -215 odds. Blachowicz (18-4) and Anderson (5-1) are both coming off a loss and need to win. The Polish fighter didn’t look good against Manuwa, but I expect him to beat the American. The opening fight is Paige Vanzant vs. Alex Chambers. Vanzant is a massive -1450 favorite and I have no interest betting in this fight. Vanzant should win, but I don’t trust her yet.